If your own or are interested in a vessel that it is not quite what you could consider the boat of your dreams, don’t be so quick to brush it aside, customize it into the boat of your dreams. If you don't like the original interior layout of your boat, you can rebuild your interior any way that you wish! If you are not quite sure where to start, there are a few things to keep in mind that will ease you into the process of restoring the interior of your boat. When transforming your boat, you have the option of changing your seats, interior side panels, dash, boat motor cover and carpets. The prices for all of these items can range from about $1800 to $5600. 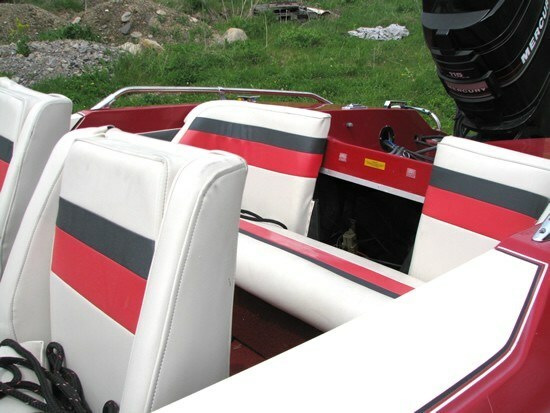 Today, there are many types of upholstery available to the marine manufacturer. Designers of interior seating have created durable upholstery, which doesn’t necessarily mean "plain." Quite the opposite actually, boat designers now have upholstery choices that are both durable and beautiful. Similarly when it comes to choosing carpeting, durability is the operative word. Ian recommends basic marine vinyl. “The fancier ones are not always ideal.” Ian recommends a marine carpet and also notes the popularity of vinyl flooring. It is also quite simple to choose the WRONG thing in this instance, so once again, keep in mind the specificities of your particular boat. The 1988 Glastron CVX 16 is great for hot summer days but choosing the wrong colours and materials could leave you with a very unpleasant boating experience. “The biggest thing with this boat is to choose light colours. Especially in sunny weather,” says Ian. Dark colors provide better visibility but they also absorb solar energy thereby creating heat gain. The same drawback applies when choosing between certain materials; Ian suggests staying away from reflective materials. So when choosing ANY materials for your interior, make sure it is not reflective. “Shiny tends to radiate heat,” says Ian. So if you are tired of your old model, consider a revamp to the interior and you may be surprised to find your craft will be transformed into a boat worthy of being displayed on a show room floor.